Now we have introduced EXADATA CLOUD SERVICE interview questions and answers in our second edition of eBook. Are you trying to wow interviewers, but aren't able to? Does the thought of being interviewed send you into a tizzy? Well look no further, because this book will help you wow the interviewers and help you get the job as Database Machine Administrator (DMA). You have probably been scouring the internet trying to get your foot in the door but there are very limited materials available. This book will also help you to prepare for Exadata Certification. This is the kit which we have built based on our years of experience as interviewee as well interviewer, Oracle DBA and DMA. If you go for raw materials, it would take hundreds of hours to prepare it which you will find here thorough research well-presented and much shorter road to clear your Exadata interview. Even if you have experience with Oracle Exadata, this guide will help you to assess your current skill level and brush up on any new improvements that might test you during the job interview. The study guide consists of 500+ topic wise questions and answers. You can also utilize this book in your day to day job. We all have spent countless hours to prepare and make it simple and effective. The book is meant for professionals, who are aspiring to become Oracle Database Machine Administrators (DMA) and preparing for Exadata certification exam. Professionals, who are keen to migrate from traditional DBA to DMA profile, would also find this book useful. This book will be invaluable to those who support and maintain such engineered systems. Can you please send me sample ? We have given link to get sample copy of this book above. Thank you for appreciating. Good luck for your DMA career. Simply superb. Here you will find thorough research well-presented contents. There is only one book on Interviews and this one is certainly the best one to review whole exadata architecture in shorter time for interview specific. This book is well written and to the point. The best part of this book is questions are given based on the topics. If you are looking to make your career and planning to move for exadata administrator/implementer than I would say that you must buy this book. People who wrote this book know what they are doing and deliver their best. Thanks all for this book. Hi, I bought this book yesterday. It is very nice and covered mostly all the exadata topics which can be asked in interview. I would strongly recommend this book who are thinking to move for dma profile. Very nice initiative team. I gone though the book. No doubt you have done your best to prepare this book. This is also like quick reference for database machine. 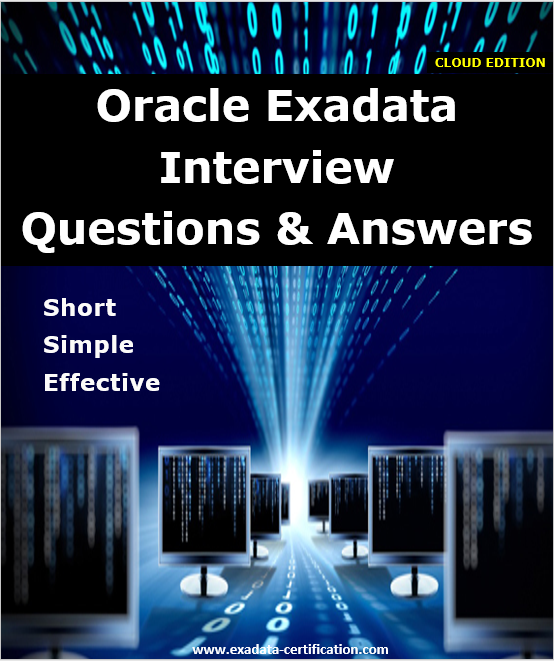 Thank you very much exadata certification team for such a nice initiative to provide a book of Exadata interview Q&A. It helped me a lot while preparing for the interview. I have already cleared all technical round, believe me all the questions came from your book. I would say you have covered all the interview questions which is required for interview. This book helped to prepare myself for exadata quickly. You have rightly said that the price of this book is very less compare to the materials you are providing which is unique in the market. I would strongly recommended to others for this book. It will not only help you for interview but you can learn about exadata in very less time by reading this book. These guys are expert in their domain who helped me for all exadata related queries which I have asked. God bless you and keep doing such kind of work. Thank you again for your wonderful support and guidance throughout my interview. Hello, I bought this book before two days. It's very well written and to the point which definitely helped me to understand exadata setup without referring any exadata docs. Even you have made this book specially for interview preparation but I could see it can be used as a reference for exadata machine preparation which include all the required topics. I think you have spent your best effort to make it available to us. It is also helpful in day to day activities because you have mentioned important commands, query and some of the tuning parameters. I would like to thank you your entire team for this initiative. Thank you Aparna for appreciating our initiative which helps us to move ahead. Nice to know that our book helps you. Good luck for your DMA career. for Oracle DBA. I have tried to learn Exadata from the source on internet but was afraid to face the interview as I have no idea that what type of questions can be asked in the interview so one of my friend has suggested to buy this book. technical knowledge whether you knows exadata or not.I would say Go for it. I would say whatever posts you have posted here helped me a lot to understand exadata practically. This one is the best source to learn about exadata machine. This book is designed to help the reader to get the most out of the Oracle database machine. It's well organized and clear, and extremely helpful for your career. It's well written and is the best learning as well refresher guide out there. This is an excellent book for exadata interview and certification preparation. If you are looking for the book which can help you to get overview of exadata in depth in shorter time and if you are looking to prepare for interview or certification than definitely you should go for this. Author has covered everything which can be required to solve the purpose of this book. I would highly recommend this book. Thank you very much exadata certification team for providing excellent book. God bless you. By trusting you, I have done one of the best thing. I bought your ebook, believe me I have never seen such a interview book for any technology that is also in detail, topic by topic. I can understand how much effort you have put to prepare this book and the value of the book is nothing compare to your dedication and effort towards to book preparation. I can say I got this book free as I have disturbed you so much to clear my doubt about exadata which itself could cost $100 which I got free from you. I think you guys are here to help the people who want to make their path in exadata career which very kind thing. Also I have not seen this type of simple and effective materials in my 14 years of IT experience. 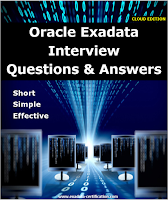 I can say your book contains ultimate collection of exadata interview questions and answers. I would suggest to prepare a book for Oracle Database also which can help the people like us and who want to make a career in oracle database field. Thank you so much for wonderful book. Nice and complete coverage of all the topics. A good book. Recommended for beginners as well as experienced oracle dba as a reference book. All the concepts are explained in an effective manner. The programs that are used in perfect manner so that you understand and grasp each and every concept very well. 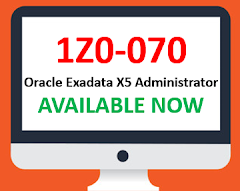 Strongly recommending for those who are really want to make a career in Oracle Exadata. By referring this book you can get complete overview of exadata in shorter time. I am big fan of your website too. It's fab book. Useful for fresher and experienced professionals. Definitely effective contents with easy language. Strongly recommending who are looking to make their career in Oracle Exadata DBA. Now a days you must know and learn exadata to grow and face the competition. Thank you very mush to all who has contributed to prepare this book. I also experienced very good response from you for any doubt which was the best part of you guys. I loved your book. It's one stop solution for exadata interview preparation. It covers all the topics. thank you very much. Recently i have purchased your ebook. It is very well written by covering each and every topics with all the questions. I have just appeared into exadata interview and surprisingly all the interview questions came from your book. You book is designed in such a way that all questions are included effectively. Now I am planning to give the certification exam and definitely i will buy your product to clear it. thanks you for support. I bought your ebook last week. My impression was like it will be ordinary interview question book but i want to take a chance because there is no materials available in market like this. Believe me it far better than what i have expected. Well written and nicely explained. The best part is you have covered each topics and that is also in simple and shorter way. Appreciating you work. God bless you. First time writing review for any product i have purchased. You have impressed me by providing lovely book. Must for who are looking to make career in Oracle technology. This book is not only help you for interview but you can use it for exam preparation as well to review entire exadata related info in shorter time. Good one guys.!!!!!! Indeed perfectly covered all the topics which is definitely helping me. Cheers..
Guys , you have done awesome job by providing this book. It helped me to get a job. Thanks you very much and god bless you. I am a DBA with 14+ experience. I didn't know about exadata. Once i was just searching study materials about exadata and landed to your website. Believe me now I became a DMA from DBA. All credit goes to your posts which i have referred. I have also purchased your eBook as well exam materials which seems finest and very well designed for the people who are looking to make their career in DMA field. I would strongly recommend your materials for beginner as well for expert who want to gain confidence on oracle database machine. God bless you and kepp continue to provide such a health information and materials which can help others to make a career. Seems you guys having excellent technical knowledge which I can see in your book and study materials. Five star for this book...Excellent and covered almost all topics with possible asked questions. Appeared for 4 interview, haven't faced single question outside of this book. Thank you.. Perfectly drafted and covered each and every topics. I don't think so interviewer can go outside of this book to ask questions. :) Thank you very much. Good effort and very well drafted. Thank you for providing such a nice book. I can say $49 is very less compare to what you are providing. Thank you again and god bless you. I have not that much experience in exadata but I have heard good part of it so I decided to do some preparation if it can help to improve my skill. I have started reading and on one day i got an interview call for exadata dba but i was not prepared. After searching here and there i landed to this website and seen this ebook. I did not have any option rather than buying this ebook to prepare for the interview so I have placed an order for it and got it in 4 hours. I have started reading it. After finishing this book i felt that now i am exadata master so i was very confident while going for interview. 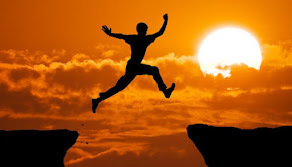 I have successfully cleared interview and now posted as exadata DBA. 99% interview question came from this book. Even today if i read this book i feel more confident on technology. You can review entire exadata in shorter time using this ebook. I am very thankful for you guys who has prepared this book. Thank you again for putting your effort for ebook preparation. I am expecting many more things like this on another technology in near future which can help us to improve our career path. One of the finest book ever i have seen for interview preparation. Thank you folks for your hard work. I would strongly recommended to the people who want to be a good DMA. Value for money. Thank you again. Simply awesome book. It meets the objective. hello, i bought this ebook before 10 days. You have done great job team. I have never seen such well prepared and useful book before specially in Oracle technology. It helped me to prepare for the interview. Simply superb collection of questions. Helped me a lot. Thank you for precious materials. Value for money. Thank you guys..one of the best book to keep for lifetime. Excellent book. Big thank you. It helped me a lot. It's not bad deal. I got this book with 25% discount. I think $49 is very less price compare to quality of the book. I would recommended everyone who are eager to go beyond traditional DBA. Thank you guys for wonderful product. Excellent contents, prepared very well, meeting the expectation. Recommending to all folks who want to make career as DMA. Thank you team for such a nice book. Worth to invest. Excellent book which covers all the topics irrespective of the exadata version you can go for it. One of the best website i have seen to learn about exadata. Thank you for providing perfect guide to clear the interview. I have cleared the interview and got a job as a DMA. Ultimate book, specially the contets covered are the best. Worth to invest. Thank you experts for providing such a nice collection on questions and answers. I have cleared both certification with first attempt. Thank team for awesome and up to date exam guide. Also I have purchased interview question book which the best ever I have seen. It covers all the topics. I don't think there is any question is left out side of this book specially to clear the interview. Your site is awesome for new and experienced professionals. Keep doing good work. You have done fantastic job guys. I was looking such book since long and my wish completed at your website. Than you very much from bottom of my heart. Your book helped me a lot. Worth to buy.I have never seen such customized interview preparation book in my 15 years of experience. God bless you. Till date the best guide for interview preparation. Must buy and review before appearing into interview. Recently purchased the book. Contents are awesome and it does make sense to invest into it. Covered all topics. It is like just read this book and clear your interview. Thank team for your hard work. Awesome book guys. It helped me a lot. Value for money. I would say it is free of cost as i got 100% hike in my new job after clearing the interview and that too with you materials. Great contents. Just went through the book once and cleared interview. It seems interviewer also read this book ;)..anyway thanks a lot for excellent contents. I would recommend to people who are looking such kind of materials. One of the best interview questions book ever i have seen. No copy paste from anywhere. You are pure technologist. Thank you for wonderful book. Nice book with well managed contents. It covers almost all the topics. Thank you. I would recommend to everyone who want to make career as DMA. Definitely in future this must be required to better to prepare now. One of the best book ever i have read for any technology interview questions. I am impressed how you have covered each and every small part of the exadata in the book. Highly recommended who wish to be DMA. Thank you very much for the effort you have put to prepare interview book. It really helped me. I would say I have got best outcome from this book. Value for money. 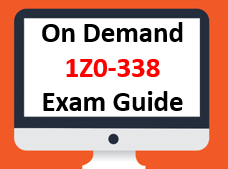 I am also planning to appear for the certification exam with the help of your exam guide. I will update once i done. I found the book very helpful and straightforward. All topics covered I would definitely recommend to DBA who wants to make career path as DMA. Thank you. Definitely it make sense to buy this ebook. Must have who want the deep insight into the exadata. Specially from interview perspective. Author has done tremendous job. What a book? ?...I never seen such type of well written and covered topics in any of the book in my 18 years of career. I have bought to understand exadata in short time and this book has absolutely helped me from scratch to expert. Awesome contents. Excellent book. Highly recommending to all my friends who want to go on different path than the traditional way. Indeed it will also help to increase you financial value. Thank you team for wonderful book. Great book which great insight of Exadata. Concepts are very well presented specially for interview perspective. Nice book. Value for money and worth to invest. You guys nailed it. Awesome book which helped me to give best shape to my career. Here I am DMA now where your contribution was a lot. I have the document version 2015, this new material includes the new features of the X6 or X7 versions? Good one, must for new comers and beginners who wan to make their career as DMA. Useful for experts as well for interview preparation. Ultimate collection of all the required questions and answers which covers all the topics specially I loved the list of questions and answers given for cloud section.